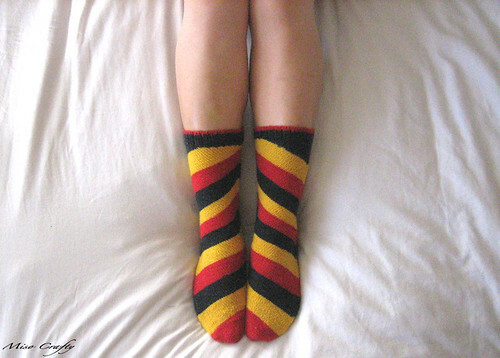 Miso Crafty Knits: Finished: Skew v.2 - German Styles! Finished: Skew v.2 - German Styles! Finally!! These bad boys are donedonedone!! They were actually done quite a while ago, I just haven't had the chance to take pictures of them 'til recently. I don't know why it took me so long to finish them up anyways, since the pattern is an easy knit (for me at least) and they practically flew off the needles. I had them knit up all the way to the ribbing the last time I went away and they just sat there in the proverbial knitting basket for the longest time . I'm going to take a stab and say that the idea of starting a new project was way more alluring than knitting 2x1 ribbing. There's not much to say about this project, as it's pretty straightforward and any issues that could've come up were worked out in the first pair. The only thing that I did different this time around was that I used a bigger needle size, which in hindsight I shouldn't have done. Even though the socks are easy to put on, they aren't a nice snug fit and kinda look a little baggy once on. I don't know if they'll shrink if I try putting them in the dryer for a bit, and I really wouldn't mind if they felted slightly either. Using the larger needle size on the skinnier sock yarn made for a much thinner fabric, even though I had made gauge. I've never used this yarn or this brand before so I wasn't sure how this would knit up. But Melissa, didn't you knit a gauge swatch? Why, yes I did. But it was a measly inch by inch square, cause I really dislike knitting swatches. I just want to get to the project dammit! Now I know for next time. There will be a next time too. Trust me. That's how much I love this pattern. The next pair will most likely be in this yarn too, but in a different colourway. I still have 4 other colourways in my stash, all bought with this pattern in mind. I don't know when I'll get around to knitting them up, since I've had my eyes on both the Jaywalker and Monkey sock patterns and I'm itching to cast on for both. BUT I'm keeping true to my promise of not starting up any new projects until a current WIP is completed, and these socks don't count cause they were finished way before that bout of Starteritis. And trust me, I have been tempted several times! My fickle brain just wants to cast on something new. Pronto! Ok, I'm gonna go knit and try to get something finished. Must. Knit. Now! PS: Sorry for the craptastic photos. My camera is seriously dying and this is the best it can do now. Ugh. They look so cool! I have never knit socks before. For some reason they just seem way too hard. I think you can totally knit socks. The trick is to knit a simple pattern, that way you don't get too discouraged if you screw up! You should definitely give it a try!